The United Nations Global Compact (UNGC) has launched the campaign “Global Goals in Action”, which aims to enhance the commitment of its member companies to implementing the Global Goals promoted by the 2030 UN Agenda. In particular, the campaign is divided into Video-Series focused on the experience of 5 multinational companies – Safaricom, Colgate-Palmolive, Iberdrola, Hilton, Natura & Co – that have effectively aligned their business strategies with the Ten Principles of the UN Global Compact and have taken concrete action on SDGs. The story highlights the benefits to be derived from joining the UN Global Compact in terms of business opportunities, international visibility and thematic insight. The Giro d’Italia CSR, the Italian tour within the 7th edition of the Salone CSR and social innovation,opened in Turin on January 30, 2019. The event – promoted by Bocconi University, CSR Manager Network, Global Compact Network Italy, ASviS, Fondazione Sodalitas, Unioncamere, Koinètica – is an awaited appointment for those working on sustainability, social innovation and CSR, and is considered the most important event dedicated to these topics in Italy. Thanks to a comprehensive cultural program, characterized by an interdisciplinary approach, the event provides in-depth information and updates on strategies and sustainability tools for businesses and other organizations. This year, the focus is on the “areas of sustainability”. Italian Business & SDGs Web Gallery | The actors of sustainable development are invited to share their “Experiences” in support of the Global Goals! 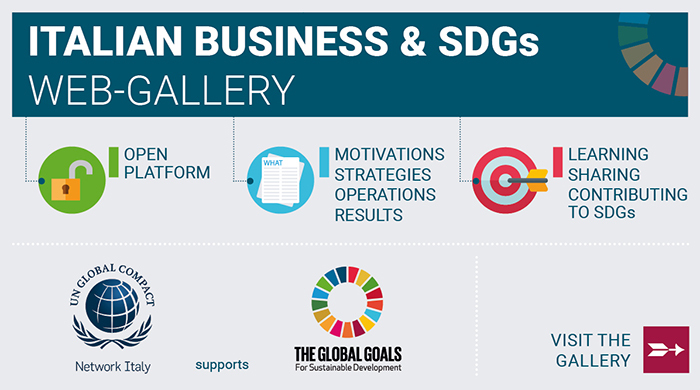 In 2018, Global Compact Network Italy (GCNI) launched the Italian Business & SDGs Web Gallery, an online platform aiming to collect, share and promote business and non-business experiences in the advancement of the UN’s Sustainable Development Goals (SDGs). In particular, the practices shared in the Gallery underline and analyze motivations, processes, strategies as well as outcomes and lessons related to the implementation of the SDGs by the private sector and by non-profit organizations. The platform is an open and evolving tool to which companies and organizations can contribute by submitting their practices. For the first time, Global Compact launches the “SDGs Pioneers Local Round”. Be the Italian Pioneer in the advancement of the 2030 Agenda! Since 2015, launch year of the Global Agenda for Sustainable Development, the United Nations Global Compact (UNGC) has integrated the 17 Global Goals (SDGs) into its mission and vision. The Making Global Goals Local Business campaign of the Global Compact aims to promote SDGs on a global scale through in-depth activities, release of information and support carried out at the local level and addressed to UNGC member companies and organizations. In this context and with the aim of enhancing its commitment to sustainable development, each year the UNGC identifies and celebrates a group of SDGs Pioneers – individuals employed in the private sector who are distinguished by exceptional commitment and leadership shown to the advancement of the Global Goals. This year, Global Compact has decided to do more, promoting the SDGs Pioneers Local Round for the first time, which will precede the SDGs Pioneers Global Round and will be managed in collaboration with the Global Compact Local Networks. The objective of the Local Round | Italy will be to recognize one Young Professional (35 and under) employed at any level in a company participating (directly or as Subsidiary) in the UN Global Compact and engaged daily in the advancement of the 2030 Global Goals. » May 17, 2019: The celebration event of the SDGs Pioneer | Italy will be held in Milan and hosted by FEEM - Fondazione Eni Enrico Mattei. Each national SDGs Pioneer will directly access the Global Round (June–September). The SDGs Pioneers 2019 will be announced and celebrated during the UNGC’s Leaders’ Summit 2019 (New York, September 2019). » increase the visibility of the company’s and its leaders’ commitment regarding sustainable development issues, understood as enabling condition for the Young Professional to operate as an “agent of change”. » meet the international community active in the advancement of Global Goals and access – with a leading role – one of the most important flagship events promoted by UN Global Compact: the Leaders’ Summit 2019. In January 2018 the United Nations Global Compact (UNGC) launched a new governance model called "One Global Compact". The UNGC’s aim is to strengthen its commitment to supporting companies all over the world in their integration of the Ten Principles into their strategies and operations and in their implementation of the 17 Goals envisaged by the 2030 Agenda. In an uncertain international geopolitical context and in a world where extreme poverty and inequality persist and climate change has become an increasingly urgent emergency, the Global Compact is one of the real guiding lights for a more sustainable and secure world. The Ten Principles have never been more important, providing an ethical and corporate framework to help the private sector generate value, strengthening fundamental rights and principles. The Global Compact Network Italy currently has 40 members with "Founding Member" status. Of these, just over 30% are non-profit organizations, confirming the strongly multistakeholder nature of the UN’s Global Compact initiative. The United Nations Global Compact (UNGC) was set up as an initiative to spread corporate citizenship on a global scale, mainly aimed at companies. However, in order to stimulate comparison and interaction, participation in the UNGC is open to organizations of various kinds, such as, for example, civil society organizations, universities and research institutions, public institutions, as well as business associations. From the activation of a multi-stakeholder dialogue to the implementation of profit/non-profit partnerships for sustainable development, there are numerous opportunities for synergy between the various actors participating in the Global Compact. Currently, over 3,000 non-profit organizations support the initiative, working alongside companies to disseminate the 10 Principles of the Global Compact and the United Nations' Global Goals 2030. All stakeholder organizations participating in the UNGC are invited to take part in the work plans implemented by the Global Compact Local Networks in their respective national contexts. The event was organized by the United Nations Global Compact in collaboration with the Global Compact Network Argentina and brought together local and global leaders representing firms, civil society, governments, and the UN Global Compact local networks, with the aim of catalysing the action and impact on the 10 Principles and the Sustainable Development Goals (SDGs). In view of the next global meeting - which will be held during the second half of the year and will be dedicated to a discussion on the progress made at national level on the implementation of the SDGs - Making Global Goals Local Business – Argentina represented an opportunity for firms all over the world to take an active part in sharing the current status recorded throughout Latin America with regard to the pursuit of the 2030 Agenda for Sustainable Development. Argentina, in particular, is a good example of multi-stakeholder collaboration in support of the Global Goals, from which all those present were able to take insights and inspiration. The inclusion of sustainability issues in supply chain management activities implies a willingness on the part of organizations to measure, monitor and evaluate their performance taking into consideration the trade-off that exists between the economic, social and environmental dimensions, from the triple bottom line perspective. This approach allows firms to have an overall and strategic vision of the supply chain, which is capable of going beyond mere risk management. On 25th October 2017, the Global Compact Network Italy, in collaboration with the Ministry of Foreign Affairs and International Cooperation (MAECI), organized a Conference called “The Sustainable Development Goals: Experiences and Progresses on Their Implementation in Europe” held at Palazzo della Farnesina in Rome. The main objective of this event was to hold a debate, among the members of the mixed panel of speakers and between them and the public present, on the policies and trends registered so far in the support of the 2030 Agenda in various sectors and at various levels, as well as on future opportunities in terms of launching new multi-stakeholder partnerships for the Global Goals. The TenP Platform was developed by the GCNI Foundation to support companies involved in collecting, analyzing, and sharing information on their suppliers’ sustainability performance. It is based on an online self-assessment questionnaire, itself based on the Ten Principles of the UN Global Compact, taking into account the key international standards and conventions on business sustainability. The 2030 Agenda for Sustainable Development, including its Sustainable Development Goals (SDGs), represents a culmination of more than four decades of multilateral dialogue and debate on tackling environmental, social and economic challenges faced by the world community. It is the most comprehensive and shared blueprint to date for eliminating extreme poverty, reducing inequality, and protecting the planet. The 2030 Agenda is universal in scope and commits all countries, irrespective of their income levels and development status, to contribute towards a comprehensive effort towards sustainable development. It also calls for the participation of all segments of society to contribute to its implementation: governments, businesses and civil society actors are considered as equally responsible for progressing and achieve it. The Sustainable Development Goals reflects many of the European Union's priorities for sustainable development. They pose a unique opportunity for Europe and its Member States to generate real sustainable impact towards an innovative, prosperous and inclusive society. For this reason the EU is committed to be a frontrunner in implementing them both in its internal and external policies and many of its Member States and the European continent at large are proceeding in the same direction. Likewise, both business and civil society organizations in Europe have explicitly expressed their commitment towards the 2030 Agenda and its Goals and have already started to work on this direction. The inclusion of sustainability issues in Supply Chain Management activities implies the willingness of organizations to measure, monitor and evaluate their performance, taking into account the existing trade off between the economic, social and environmental dimensions from a triple bottom line (TBL) viewpoint. This approach allows companies to have a comprehensive, and above all, strategic vision of the Supply Chain: reducing supply and distribution costs; defining cooperation and coordination relationships with their suppliers; and improving customer satisfaction.